In what has been a shocking turn of events in a sport plagued by controversy, current Tour De France yellow jersey leader, Michael Rasmussen, has been ousted from the tour. The 33-year-old Dane, was expelled by his Rabobank team late Wednesday for lying about his whereabouts to avoid drug tests before the Tour started July 7. Instead of being in Mexico, as he repeatedly said, he was seen training in Italy. That unraveled his week long defense that he had evaded the unscheduled tests by mistake, not by design. The sport has turned to constant monitoring of its participants such that if your location is not known, it is assumed you are hiding something such as doping. Although harsh, I see this as a good measure to help clean up the sport and bring it back on track. 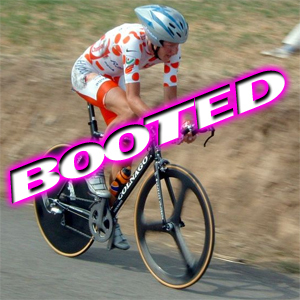 I was slated to pedal for Team USA but I got banned, for insane awesomeness. This entry was posted on July 26, 2007 at 9:44 am and is filed under Superhuman. You can subscribe via RSS 2.0 feed to this post's comments. You can comment below, or link to this permanent URL from your own site.